5.5 Earthquake hits off the coast of Oregon, USA. 5.5 Earthquake hits Kepulauan Tanimbar, Indonesia. Poland – An underground earthquake left at least three miners dead and five missing at the Rudna mine in Polkowice, south-western Poland, according to state media. The earthquake of magnitude 4.4 struck just after 9pm Tuesday local time, according to the US Geological Survey. The quake was centred a shallow 10km (6.2 miles) underground, the USGS said, which would have magnified its effect at the mine belonging to state-run copper producer KGHM. Tropical cyclone (tc) 04b (Four), located approximately 822 nm south-southwest of Calcutta, India, is tracking northwestward at 12 knots. Spain – A woman was swept away during flash floods in a village 45 kilometres from the Catalan capital of Barcelona in Spain after her GPS device sent her driving across a riverbed through the village of Sant Llorenç d’Hortons. Turkey – Unprecedented rainfall in some western towns led to small-scale floods on Monday and Tuesday while snowfall is forecast for central and northwestern Turkey on Wednesday. Balıkesir province was among the hardest-hit by flooding. A night of rainfall triggered floods in the town of Gömeç, where a bridge collapsed and flocks of sheep drowned; no other casualties were reported. Rivers breaching their banks threatened residences and shops in the small town. Ayvalık, a popular seaside town in the province, was also heavily inundated after downpours that started on Sunday increased in intensity late Monday. Schools in the town were closed Tuesday as rainfall accompanied with strong winds damaged buildings, felled trees and blocked access to several streets. Some residents were trapped in their houses for hours, long after downpours hit early Tuesday. Canada – Crews in Thunder Bay, Ont., have remained busy as approximately 80 millimetres of rain fell across the city since Monday morning flooding parts of the city. Saudi Arabia – At least seven people died and many others were injured or trapped by heavy rain and floods that swept various regions of the Kingdom, press reports said on Tuesday. The dead included three young Saudi men in Bisha, two others in Baha and two expatriates who were struck by a thunderbolt in Qunfudah. Torrential floods also destroyed a number of houses, blocked roads and overturned vehicles. The rain and floods in the last few days uncovered the ineffective drainage systems in many parts of the country. The rain inundated various parts of Qunfudah governorate and washed away large sections of the International Road linking Jeddah and Jazan. The Arctic Ocean may seem remote and forbidding, but to birds, whales and other animals, it’s a top-notch dining destination, so animals are flying or swimming thousands of miles to get there. But the menu is changing. Confirming earlier research, scientists reported Wednesday that global warming is altering the ecology of the Arctic Ocean on a huge scale. The annual production of algae, the base of the food web, increased an estimated 47 percent between 1997 and 2015, and the ocean is greening up much earlier each year. These changes are likely to have a profound impact for animals further up the food chain, such as birds, seals, polar bears and whales. But scientists still don’t know enough about the biology of the Arctic Ocean to predict what the ecosystem will look like in decades to come. Between 3 and 10 November 2016 the National IHR Focal Point of Saudi Arabia reported six (6) additional cases of Middle East Respiratory Syndrome (MERS). Two (2) deaths among previously reported MERS cases were also reported. The number of cholera cases in Haiti increased to two or more times the numbers observed prior to Hurricane Matthew, which landed on Oct. 4, the Pan American Health Organization (PAHO) reported today. Through the end of October, a total of 34,656 suspected cholera cases, including 339 related deaths have been reported in Haiti. Since Hurricane Matthew struck Haiti October 4, more than 5,800 suspected cholera cases have been reported by the Ministry of Health. Flames tore through the Great Smoky Mountains, killing at least four people, scorching hundreds of homes and businesses and sending more than 14,000 fleeing from the resort towns of Gatlinburg and Pigeon Forge. Wildfires have ravaged the Southeast throughout the month, and the acrid haze of smoke has settled in across the region. But emergency responders seemed blindsided by the intensity of the wind-whipped flames Monday night. 5.4 Earthquake hits the Moluccan Sea. 5.4 Earthquake hits the Owen Fracture Zone. Lack of Tornadoes in USA – The trend of the low number of tornado reports this year in the U.S. has continued through late November. No tornadoes had developed in the U.S. this month through Nov. 21. In fact, the last tornado that occurred prior to that date was on Oct. 14, when two tornadoes were reported in Oregon. However, the streak came to an end on Nov. 22 when one tornado was reported nine miles west-northwest of Manhattan Airport in Riley County, Kansas. An airline pilot reported that a weak funnel contacted the ground for less than two miles, but there was no visible debris or damage. There were four more tornado reports Nov. 27 in southern Nebraska, all brief touchdowns, bringing November’s tornado count to five. Some damage was reported from a tornado near Red Cloud, Nebraska, according to the Storm Prediction Centre. The Texas Department of State Health Services and Cameron County Department of Health and Human Services today announced the first case of Zika virus disease likely transmitted by a mosquito in Texas. DSHS is supporting Cameron County’s response to the case and to the ongoing risk of Zika in the community. Epizootic Hemorrhagic Disease, a viral disease that killed more than 3,700 deer in 2012, has impacted the population this year, with more than 2,000 deer found dead in 23 counties. The heaviest losses have been in Brule, Aurora and Beadle counties. South Dakota Game, Fish and Parks issued more deer licenses this year, but the animals may be hard to find. Sydney hospitals are fighting an outbreak of long-forgotten scurvy. The disease is caused by not getting enough vitamin C from fruit and veg. Doctors found it when a patient’s wounds didn’t heal for seven months. More overweight diabetic patients with poor diets were diagnosed. Scurvy was common in 18th and 19th Century sailors at sea for months. In the West Pacific: Tropical Depression 29w (Tokage), located approximately 242 nm west-northwest of Manila, Philippines, is tracking southwestward at 17 knots. Italy, Update = The rain across northern Italy has finally eased, a great relief to those living close to the banks of the River Po, the country’s longest. More than two and a half months worth of rain fell in less than three days, swelling the Po and its tributary, the Tanaro. The Po overflowed in Turin, causing widespread flooding. At one point the Po was more than one metre above its danger level and most bridges in the city had been closed because of safety concerns. It is reported that the floods claimed the lives of two people. Greece – Fire officials in Greece say a 32-year-old man drowned on the island of Zakynthos after flash floods hit the island early Sunday. Heavy rains drenched both Zakynthos and the Greek capital of Athens late Saturday and early Sunday, resulting in 470 emergency calls. Several major roads in Athens became impassable. It would be nice if President-elect Donald Trump took one of the most serious threats to life on earth seriously, but he does not. Trump called global warming a Chinese “hoax” during the campaign, and he’s assigned a science dunce to lead the transition at the Environmental Protection Agency. The comforting news is that America can move past the black hole of ignorance in Trump’s Washington — or New York or wherever he is. Enlightened state and city governments, as well as the private sector, can provide the leadership. As it happens, they’re already on the case. Huge example: During the Paris climate change conference last December, Bill Gates organized a handful of billionaires and came up with $15 billion for his Breakthrough Energy Coalition. The group’s mission is to fund research on radical new clean energy technologies. California’s war on greenhouse gases is already 10 years old. Its original goal was to reduce the state’s carbon footprint to the 1990 level by the year 2020. The new goal is to shrink the carbon footprint to 40 percent below the 1990 level by 2030. California is the world’s sixth-biggest economy. Regional compacts in the West, in the Northeast and elsewhere are following California’s lead. There’s also one in South Florida, where “king tides” are now flooding streets on perfectly sunny days. Former French President Nicolas Sarkozy, again running for the office, vows to slap a carbon tax on American imports if Trump pulls us out of the Paris climate deal. Could that happen? Absolutely, according to Esty. Countries failing to meet international standards that form the base line for fair competition can be punished. And 195 nations have joined the Paris agreement. Climate change has become a major priority for the U.S. Department of Defense. Rising waters already threaten Navy installations along the mid-Atlantic coast. And as the Arctic ice melts, Russia is opening bases in the region. In the images, they saw evidence that a rift formed at the very base of the ice shelf nearly 20 miles inland in 2013. 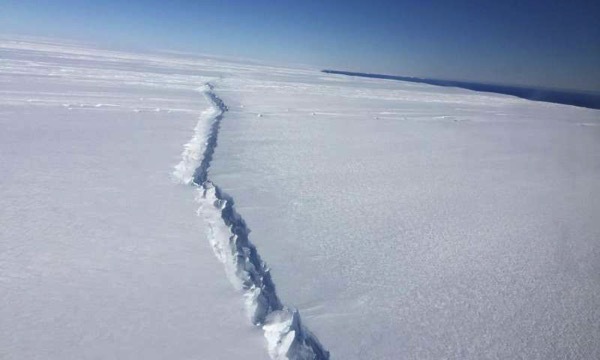 The rift propagated upward over two years, until it broke through the ice surface and set the iceberg adrift over 12 days in late July and early August 2015. They report their discovery in the journal Geophysical Research Letters. In a follow-up on the malaria epidemic in Venezuela this year, according to a statement from the Venezuelan Society of Public Health Network, the local transmission case tally has grown to 200,000 through Nov. 5. “In the first 44 weeks of the year, 199,902 new indigenous malaria cases were reported throughout Venezuela, 75 percent in Bolivar State. Authorities say 2,500 firefighters and other personnel are making progress on containing some of the biggest wildfires in western North Carolina. As of Saturday morning, five of 11 wildfires listed in the Joint Information Center’s update were more than 50 percent contained. Two of the fires also were affecting parts of South Carolina and Georgia. The Party Rock fire near Lake Lure was 80 percent contained as nearly 300 firefighters and other workers continued to fight it. That’s down from a peak of about 900 personnel. The Maple Springs fire in Graham County, the Chestnut Knob Fire in Burke County and the Boteler Fire in Clay County were also all above 70 percent containment. Two other large fires were less contained. The Pinnacle Mountain Fire includes parts of Transylvania County and Pickens County in South Carolina. About 250 fire personnel had that fire about 40 percent contained after completing a fireline Friday night. A public meeting will be held Sunday in Cleveland, South Carolina. The Rock Mountain Fire, which crosses into Georgia from Clay and Macon counties, was 40 percent contained by nearly 600 firefighters. Rain expected to help fighting North Carolina wildfires over the next few days.